A host of important macroeconomic data will be coming out in the first week of 2018, including manufacturing PMI releases for December 2017. 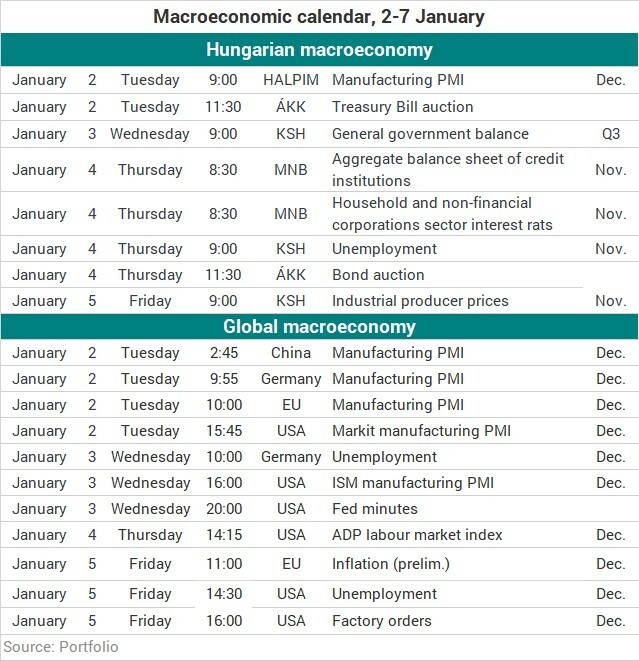 These will give us an almost full picture on how the largest economies in the world fared last year. In Hungary, you should keep an eye on the general government balance and also on the Government Debt Management Agency (ÁKK) that will kick off government security issuances for 2018. As usual, the first working day of the month, which now falls on a Tuesday, will deliver manufacturing PMI releases. The Hungarian print edged up to 60 points in December from 58.6 in November, which is also relevant for Q4 GDP growth. Similar reports will be coming in from the rest of the world, first from China, then from Europe in the morning and from overseas in the second half of the day. On Wednesday morning, the Central Statistical Office (KSH) will publish the balance for the general government sector for the third quarter of 2017. The key figures (budget deficit, GDP growth, etc.) have already been released. The last time it was the central bank (MNB) that published those in scope of its financial accounts report last Friday, but the stats office will offer details too. In the United States, the Federal Reserve will release the minutes of its latest policy meeting when it raised interest rates 25 basis points, as expected. The minutes are unlikely to include future policy measures, but investors do keep an eye out for these documents in any case. The Hungarian central bank (MNB) is set to publish the aggregate balance sheet of credit institutions on Thursday, along with the interest rates for households and non-financial corporations. The usual monthly releases are unlikely to deliver any surprises, but it could be interesting to see if banks were net buyers of government securities also in November or not. The stats office will publish unemployment data for November, and the Government Debt Management Agency (ÁKK) will hold the first bond auction of the year in the afternoon (after a Treasury Bill auction on Tuesday). The event should be watched a) to see the amount of bonds offered for sale (the ÁKK tends to put up a massive lot of bonds so early in the year), and b.) to see if yields on the longer end of the curve could drop further, as the central bank wants them to. The ADP index showing business sector employment is due out in the U.S. also on Thursday. On Friday, the KSH is set to release small-weight stats on industrial producer primes, whereas preliminary inflation date in the European Union could stir markets too. In the second half of the day, we’ll have jobless figures out in the U.S., which have been losing importance in relation to the Fed’s monetary policy.